Chairman of All India Council for Technical Education, Dr S S Mantha, Executive Director of Sri Sakthi Auto Motors Mr Shankar Vanavarayar and Director of Central Leather Research Institute Dr Asit Baran Mandal at the two-day regional workshop on AICTE-CII Survey of Industry-Linked Technical Institutes and Industry-Academia Collaboration held at the Central Leather Research Institute in Chennai on 24-25 May. 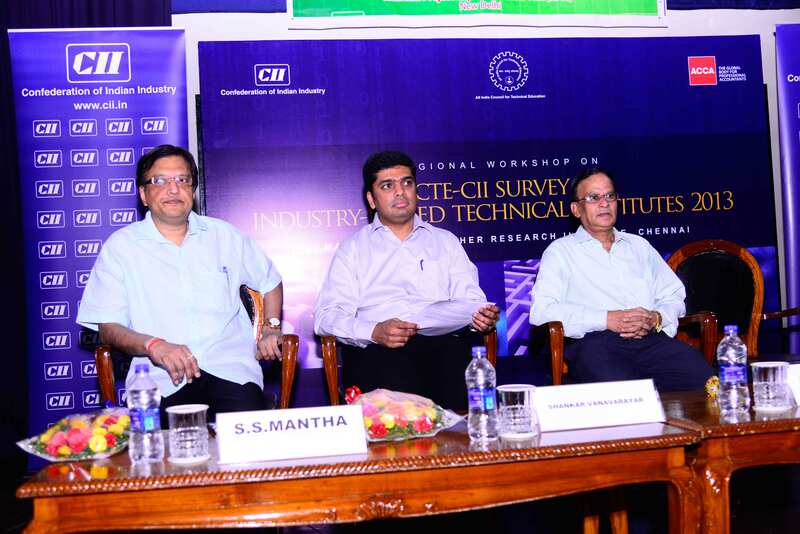 More than 55 Expressions of Interest (EOIs) were signed between industry and institutes at twin workshops organized by the Delhi-based higher education team of CII at the Central Leather Research Institute (CLRI) in Chennai on 24-25 May. The first workshop was with the All India Council for Technical Education (AICTE) on AICTE-CII Survey of Industry-Linked Technical Institutes and the other was with the Ministry of Human Resource Development (MHRD) on industry-academia collaboration. While the workshop on survey saw participation from all technical institutes in the southern region, that on industry-academia collaboration was specially meant for engineering institutes which are being funded by MHRD under the first phase of Technical Education Quality Improvement Programme (TEQIP). Of the 34 eligible institutes in this category from the southern region, more than 25 participated in the workshop. The aim was to facilitate interaction between these engineering colleges and industry leaders so that tangible proposals could be put across the table and definite agreements signed between the two parties on various initiatives ranging from student and faculty exchange to faculty upgradation, internships for students, research partnerships and incubation centres. Some of the top corporates of the southern region such as Ashok Leyland, Cognizant Solutions, Sri Sakhti Auto, Tata Consultancy Services, UK Gems, Take Solutions, Altair, Labtech Electronics, Frontline Electronics, ARM Embedded Technologies and KKM Soft participated in the business-to-business meetings with TEQIP institutes and signed over 50 agreements with them for collaborative activities. Inaugurating the survey part of the workshop, AICTE Chairman Dr SS Mantha stressed on the need for institutes to go beyond the prescribed minimum and improve the quality of education being imparted by interacting proactively with industry. He lauded the efforts of CII in this direction and said that AICTE’s partnership with CII had grown stronger and deeper over the past two years. CII conceptualized and started the survey on industry linkages of technical institutes in 2012, in partnership with AICTE, and in its second edition this year, the scope has been enlarged from engineering to management, architecture and pharmacy also. Speaking on this occasion, former Chairman of Young Indians and Executive Director of Sri Sakhti Auto, Mr Shankar Vanavarayar said it was time industry rose to the challenge posed by academia and provided it the support it required in terms of giving inputs on curriculum, faculty, internships for students and research projects.